Enough talk! It's time for action. The youngest on the crew, Bumblebee is what some - especially Autobot Ratchet - would call over-eager. It's not his fault he prefers action over talk. Talk ist just, you know, boring. Especially when you could be racing at top speed into a fight, or boosting into the air to launch a few well-placed energy stingers at an enemy. Nothing scares Bumblebee, not even Megatron. Robot Mode: Pretty much an exact replica of the Bumblebee we see on the TV screen. Animated Bumblebee comes to life in this figure. Toy BB is a very nice looking, highly posable figure. The posability is only slightly restricted in the shoulders, but once you figure out how the shoulder joints work you can still throw him in pretty much every pose you want. I especially like BB's face, which easily replicates the friendly, if slightly arrogant look cartoon BB often sports. You can mount the two booster rockets included with the figure on his back, making him ready to launch into the sky. There are some downsides to the figure, though. Two, in fact, those being the 'stingers' he deploys from this hands. In the cartoon BB replaces both his hands with a stinger each. 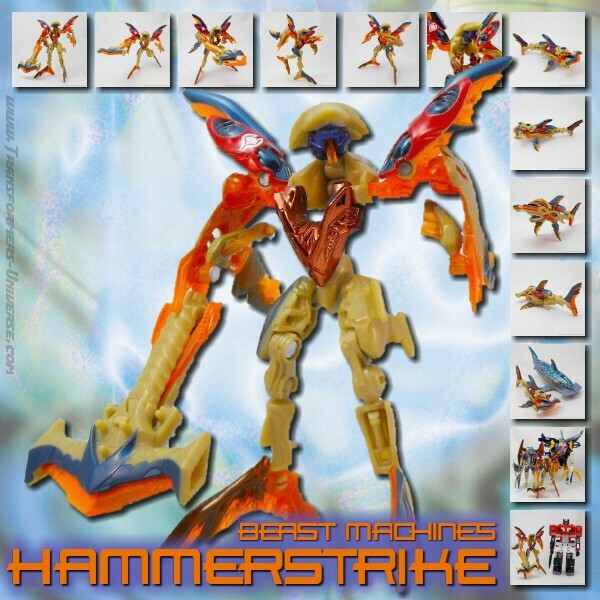 In this toy version here, the stingers are sitting on the inside of the forearms and each arm only sports half a stinger. The hands swivel back into the forearm, but you can also leave them out. The two stinger-halves combine into a complete one when you move BB's arms together. Personally I'd have found it much better if they'd engineered things differently here and given BB two individual stingers instead of this contraption here, so he loses some points because of that. One other thing cartoon BB can do that toy BB can't: In the cartoon BB often deploys wheels from his feet to skate along in robot mode. No can do for toy BB. Would have been nice to include this gimmick, but it just wasn't to be. So bottom line: A good figure, but the design of the stinger gimmick and the lack of a 'skater-mode' drag him down somewhat in my opinion. Alternate Mode: A small yellow sports car with a police siren on top serves as Bumblebee's Earth-based vehicle mode. The vehicle looks pretty much exactly like it did in the cartoon, down to the siren on top. If you look at the front view screen you can see two small screws behind it. I'm not sure it's intentional, but those screws make it look like BB's car mode has eyes behind the windshield, somewhat like something from the Pixar movie "Cars". A funny little detail. BB's booster rockets can be used in this mode as well, of course. You don't even need to take them off for the transformation, they remain in the same place and don't hinder the process. The car doesn't feature any other gimmicks, but that's pretty much standard for the Animated series so far and I really don't mind. Remember, back in G1 days, transforming into a car WAS the gimmick. So bottom line, an unspectacular, but solid vehicle mode. No complaints. Remarks: Bumblebee as seen in the Animated cartoon series is a mixture of the original Bumblebee and the character of Hot Shot from the Armada series. He's got BB's friendly nature, but also Hot Shot's impulsiveness and need for speed. I never liked Hot Shot, so maybe that's the reason that BB isn't among my favorite characters from the Animated series, despite being a big fan of both the original BB and the Movie version. The figure as such does a decent job of portraying the character we see on the screen, the only real flaw being his stingers, which I think could have been done a lot better. So overall, a good figure, but far from the best of the Animated series.